Pumpkins are a perennial favorite for autumn decorations and Halloween festivities, gracing porch steps and centerpieces alike with their vibrant color and charming presence. Pumpkins—and their cousins, winter squash—are available in a cornucopia of shapes, colors, and sizes. Tiny jack-be-little pumpkins that fit in the palm of your hand. Enormous Atlantic Giants that can only be moved with a forklift. Butternut squash with smooth, creamy skin. Ornamental gourds studded with baroque protuberances in a panoply of color. Pumpkins and squash at a roadside stand in Wisconsin farm country. 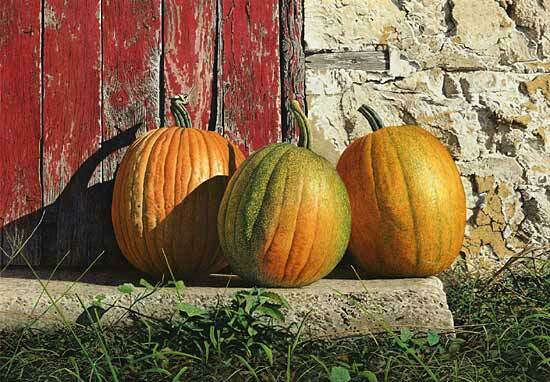 But it’s not simply their beauty that makes pumpkins so beloved this time of year: it’s also their status as cherished symbols of abundance and plenty. For the farmer or gardener, pumpkins are one of the final crops of the growing season—a sweet reward after months of tender care, and a joyful representation of a bountiful harvest. For many (including me), pumpkins also evoke warm childhood memories. I am reminded of cozy pumpkin patch hayrides, the messy fun of carving jack-o-lanterns, the crunch of oven-roasted pumpkin seeds, and the sight of candlelit jack-o-lanterns greeting me and my costumed friends on Halloween night. With such charming beauty coupled with rich, meaningful symbolism, it’s no wonder that so many artists are inspired by pumpkins. 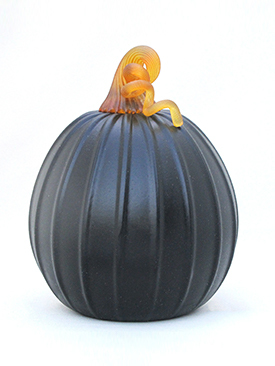 And—bonus—a pumpkin’s cylindrical form makes it perfectly suited to glassblowing. 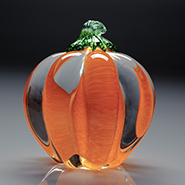 So it’s easy to see why pumpkins are especially popular with glass artists—and why glass pumpkin patches have sprouted up at art centers and studios across the country! 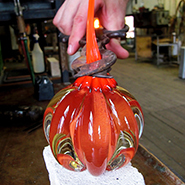 Left and center: A glass pumpkin comes to life in the Anchor Bend Glassworks studio. 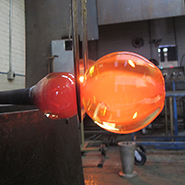 Right: Large Orange Pumpkin by Anchor Bend Glassworks. The sheer diversity of the Curcubita genus is reflected in the breadth of glass pumpkins available in our Artful Pumpkin Patch. But artists don’t simply recreate nature—they use it as a springboard for their own imaginative flourishes and personal touches. You’ll find pumpkins and squash in a dazzling array of colors and patterns never found in a garden—indeed, impossible to grow anywhere besides an artist’s imagination! 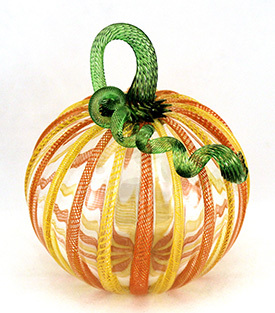 One of the ways that artists make pumpkins their own is through the stem. 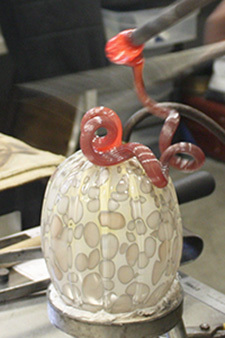 This also happens to be my favorite part, not only because I am drawn to sinuous shapes, but also because I delight in the variety of creative approaches artists take to represent a pumpkin’s coiled tendrils. 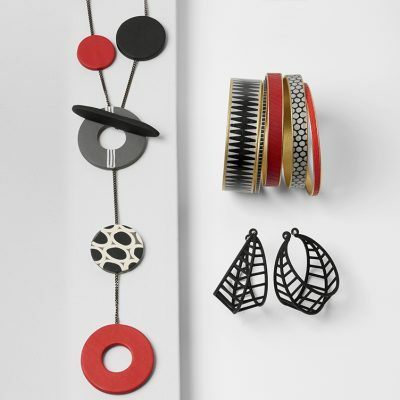 Upper left: Pumpkin in Burnt Red by Drew Hine. 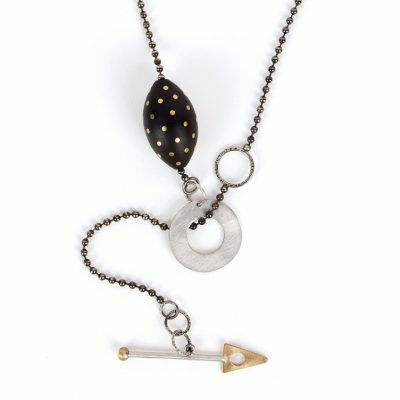 Upper right: Speckled Pumpkin by Scott Summerfield. Bottom: Medium Ivory Autumnal Pumpkin by Treg Silkwood. 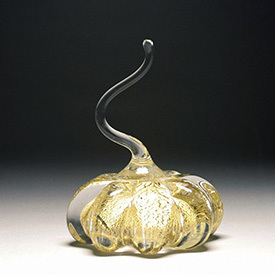 In addition to getting creative with the stem, many glass artists use the pumpkin’s simple form as a canvas for intricate surface design. 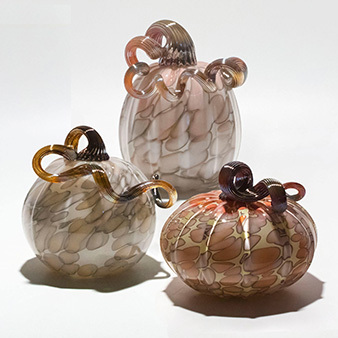 For instance, these pumpkins by Ken and Ingrid Hanson are fantastic examples of latticino canework and murrini—traditional Italian glassworking techniques for which the artists are renowned. 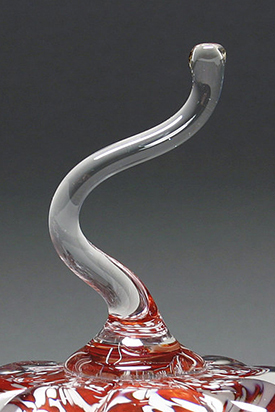 Other artists take advantage of glass’s unique optical qualities to create dramatic effects. 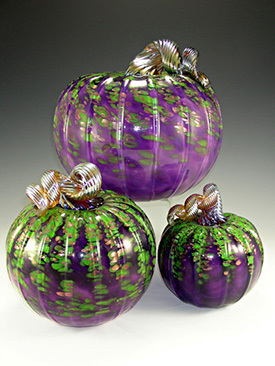 Both pumpkins below have clear bodies that refract light, creating a striking interplay with the core of dichroic glass or gold leaf. To my eye, these effects give these pumpkins a hint of magic. 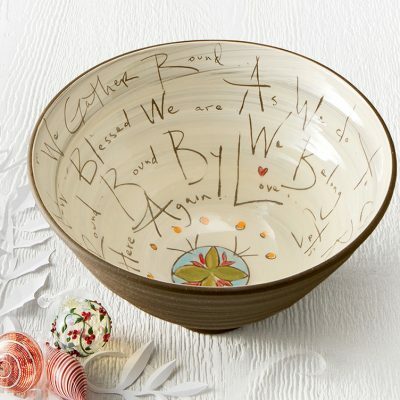 Still other artists make a statement with color. 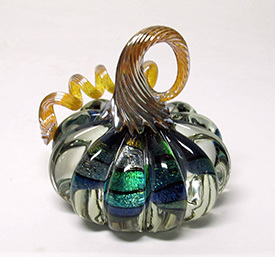 Some, like Mark Rosenbaum, revel in vibrant colors and bold patterns, while others, like Hudson Beach Glass, focus on a single color with a matte finish for a refined, modern look. 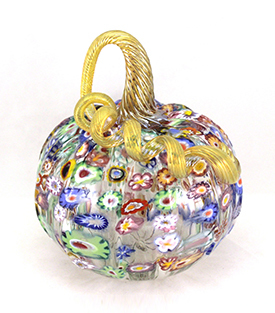 These are only a sampling of the remarkable glass pumpkins available in our Artful Pumpkin Patch. 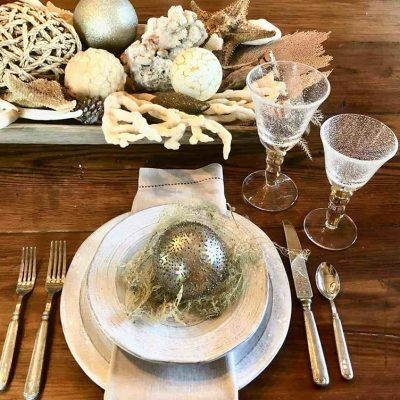 I encourage you to explore the rest of this pumpkin wonderland to discover the many ways that artists interpret this beloved squash—perhaps you’ll find a few that catch your eye and evoke fond memories of autumn. Happy picking!